Posted by Jonny Greenwood on 11/19/2018 3:45:14 PM. 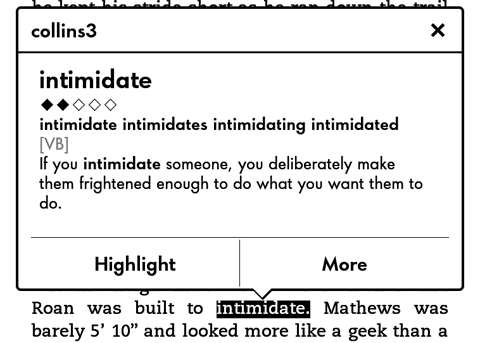 One primary reason that I like reading on Kindle is the utterly convenient dictionary feature. To look up the definition of a strange word on Kindle, we just need to press and hold on the word. But sometimes the default dictionary doesn't work very well especially when it meets some plural nouns or past participle. Here we are going to introduce how to add or change the Kindle dictionary. German version please refer to Wie man ein Wörterbuch in Kindle ändert oder hinzufügt. The dictionary for Kindle is actually a .mobi file, which can be downloaded freely from the internet or bought from Amazon Kindle Store. Here I got a Collins Cobuild V3 dictionary file. Yes I like Collins dictionary since my college years. Every Kindle user should have a USB cable in the box which is shipped with the device. Find it and use it to connect Kindle and computer. Seconds later there will generate a Removable Disk called "Kindle". Open it and find "documents\dictionaries" folder. Now all the steps on computer are finished. The following job is to make the dictionary file work on Kindle. As I am using a Kindle Paperwhite at the moment, so I am going to take Kindle Paperwhite for example and introduce the process. And let's start with the "Dictionaries" screen. Press the "Dictionaries" option, and we can see the default Kindle dictionary - "Oxford Dictionary of English". By pressing it we can change the primary dictionary of english. As the screen shows below, "Oxford Dictionary of English" is defaultly chosen and we need to switch to "collins3", which is recently imported by me. Then back to the previous screen we can see the default dictionary for english has been changed. Now let's check the result. Want to add foreign language dictionary to Kindle? No problem! And the steps are pretty similar to the above. Suppose I am reading a book written in french, so I need a french-english dictionary. First we need to download a french to english dictionary file, then transfer to the Kindle dictionary folder. As this is the first french dictionary in my Kindle, I need not to change any settings. 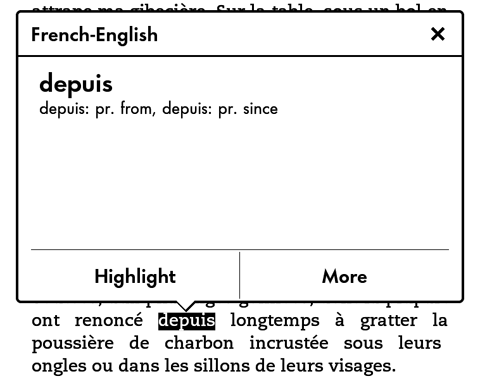 The Kindle will choose this file as the primary dictionary for french language. Then open a french book, press and hold on a word I don't know the definition, and see what happens. Which french dictionary are you using? I randomply picked on from the internet, and it is not good IMO. Try New Dictionary GALO. It's a great dictionary. Thank you very much for such clear and useful tips. Very helpful. The instructions are clear and concise. i accidentally deleted my dictionary folder. can you send me a email with the dictionary file as an attachment. Thanks for the article. Can you point to links where the dictionaries you've mentioned can be downloaded? As the dictionaries are not made by me, and I just used them for writing this article. So I don't think it would be fine to add the download link here as I do not know if that dictionary is legally free to use. However, you can search what you want in google, that's how I found these dictionaries. thanks a lot for your great article. Finally, I have managed to make my dictionary work on my Kindle 4. A free dictionary that is good for the mind. I can't post the link but search for "jsomers webster 1913". His blog post tells why, then how. A free dictionary that is good for the mind: I can't post the link but search for "jsomers webster 1913". His blog post tells why, then how. Are those dictionaries for free? Somehow I ended up downloading a Portuguese dictionary (not from the Kindle store) and it is now included in my Kindle. Yet, when I went to the Kindle store, that dictionary allegedly costs 9.99 USD. I checked my email and my Amazon account and there are no charges. Any thoughts on that? I can't find how to install this on my kindle, it shows up as a book and I can't choose the dictionnary in the settings :( Any help ? Hi Alice, did you find a solution as I have the same problem. Even if the "dictionary is not legal" there is no problem to post the link. It is not illegal to post a link, you are just showing someone an address, what they do there is up to them. For instance I can post a link to a pornsite which might be illegal for you if you are under 18, but it's not up to me to determine whether you break the law or not by going there and using the site. It is the same as saying, oh there is a knife on the ground in this location. If someone else goes to pick up the knife and kill someone, you are not a criminal for murder or even for accessory to murder. You are just giving information, which is not illegal. If you can use torrents, kickass torrents (kickass.so) is usually a good site to find ebooks as well as music or other files as well. thank you very much, very helpful and very easy. Now I can learn my Spanish! How to add a dictionary that translated English to another language ? In paperwhite and on android running tablet? Is it possible to add persian dictionary to Kindle? Of course, as long as you can get a Persian dictionary. "Kindle Paperwhite: Home -&gt; Menu -&gt; Settings -&gt; Device Options -&gt; Language and Dictionaries -&gt; Dictionaries"
Doesn't work anymore with 5.6.2.1 firmware, it has only one choice even though there are several dictionaries. Stay away from this last firmware update. As it did not schow in the list, I downloaded (I use email with attachment) it 2 more times. Then I looked in Settings, and now I have 3 or 4 dictionaries sitting there (each 6M). Can I delete them without computer and cable? And there is no dictionary folder. ??? I have tried everything to add spanish dictionary RAE to my kindle paperwhite device. I even contacted the Amazon support, and they couldn't help me (because there is no version for kindle on the site, only for Android devices). The thing is, RAE is free for anyone with kindle. I tried also with the RAE dictionaries I found on the web in several extensions and nothing. The device sees it as a book that can be read but not like the dictionary that can be consulted while reading a book in spanish. Any advice? It's practically useless for me if I have to use spanish-english dictionary, I need monolingual and a very good one like RAE. Wow, Easy to understand your instructions and it worked immediately. Have had my Kindle since December 2012 and while the Kindle had access to a dictionary my alternate Kindle reader, being my PC did not work. I do most of my reading on the PC and would have to minimize the Kindle and then look up a word or phrase somewhere else on my PC. This is time consuming and a bit of a hassle. Have tried a few times to install a dictionary on my PC Kindle but without any success. Doesn't work with my kindle 4th gen now. Appears as a book but not in the list of dictionaries :( Any help appreciated. Thanks for all your valuable efforts on this website. My mum takes pleasure in getting into internet research and it's obvious why. All of us hear all about the lively manner you offer practical techniques by means of the blog and as well as improve participation from website visitors on that idea and our own simple princess has always been understanding a great deal. Enjoy the rest of the new year. You have been carrying out a good job. Thanks for your compliments. We will keep working hard. Thank you very much for the info. Could you help me please with Arabic dictionary? Amazon doesn't have one for kindle and I didn't find any searching the net.